On January 23, 2006, a bloody war was triggered by a simple sound: the banging of a gong. No rallying fanfare, no bloodthirsty yell; just an eerie silence. Those long, uneasy seconds of dread. The calm before the storm. 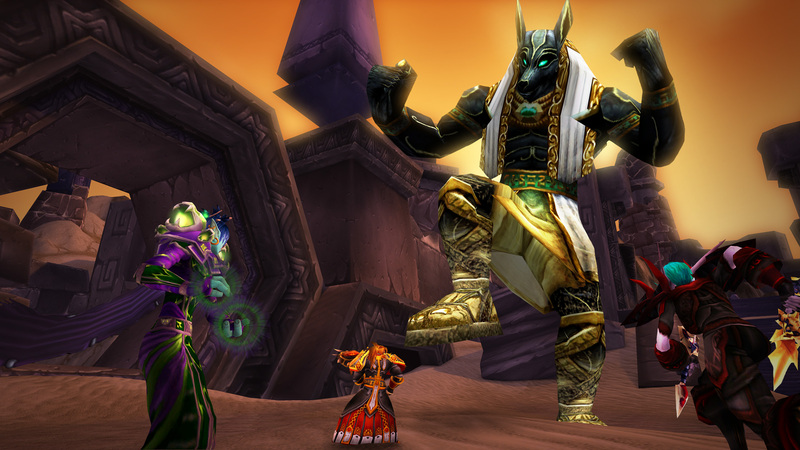 Standing shoulder-to-shoulder before the Scarab Wall, no one could have predicted what would happen—an epic ten-hour battle that claimed the lives of thousands of Azeroth’s bravest—or fully comprehended the effect it would have. That’s not to say the battle at the gates of Ahn’Qiraj came as a surprise. When the menace of C’Thun turned into an urgent threat, leaders across the world pored over plans and forged unlikely connections as pressure mounted. Both factions knew war was coming and personal glory was a hubris no-one could risk. Any notion that one army could defeat General Rajaxx and his colossal battalion was soon abandoned as fantasy. This uneasy alliance was not without its critics. Some showed their disapproval by shunning the war effort altogether, but others expressed opposition through acts of aggression. Rogue elements on both sides, unwilling to stomach this perceived betrayal of their faction, did not sit idle. Just as neutral auction houses became a tool for factions to share resources, they also became virtual battlegrounds. Crucial resources were picked up for next-to-nothing and sold on for personal gain. As with all wars, those who profit aren’t always the brave. The sheer scale of that war effort is almost unimaginable when we live in a time of extended storage and fast mail. But back then, backpacks and cloth stacks were smaller. Getting precious resources gathered, sorted, and sent took many hours. And it took several weeks to source bandages, food, and equipment—resources that were in high demand and would soon dwindle. We would do well, in these dark times, to remember the courage and spirit of those who were there at the Gates of Ahn’Qiraj. We must have long memories if we’re to make quick work of the demon forces we now face. From January 21–23 we ask that you join us as we remember the fallen and celebrate the victory. All of Azeroth are invited to a special holiday, ‘Call of the Scarab,’ where we will gather to perform acts of remembrance and share our factions’ pride. Players who are in a different phase can speak to Rhonormu near the gong to enter the correct event phase. Were you there? Share your memories with us in the comments below.